Well not quite the woods, but it involves trees and digging (in the dark). 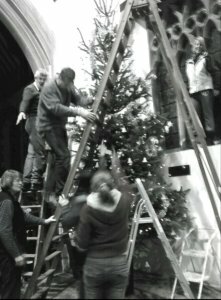 Every year the church Christmas tree appears and disappears – on a Monday evening, which should be bellringing practice, but ... the ringers arrive with gardening gloves, barrow, shovel, saw, torch, and heavy metal. Carrying the tree from our supplier’s lorry in Norreys Avenue can be tricky. The person at the trunk end has something solid to hang on to but everyone else has to get some sort of hold on the springy branches. The tree stands in an old dustbin full of soil, which takes two barrow loads to fill. It is muddy and dark, in the rough ground in the churchyard from which we dig it. Getting the soil into the bin is harder than you might imagine, with branches stick out all round, and of course someone has to hold the tree vertical while the soil is put in. We have to ram the soil to compact it – if we didn’t, the tree would lean to one side and then keel over – but that is even more difficult than shovelling. Ramming the soil in an empty bin would be easy, but it isn’t when you are poking your hands down between the branches. The heavy metal helps though. Once the tree is self supporting, out come the ladders, and on go the silver bells, stars, tinsel and lights. There is a lot of tree to cover, and someone always points out a bare patch that needs filling, so it seems ages before we can reward ourselves with mince pies. A few weeks later, we reverse the process, which is quicker, so with soil back in the churchyard, and dustbin and decorations safely stowed in the tower, we normally get some time for ringing afterwards. I wrote about the tree six years ago , but thanks to modern technology (Katie’s phone has a camera in it) you can now see us hard at work.